Puritan , A.W. Pink observed; “Quite so; but what is ‘Christmas’ ? Does not the very term itself denote its source - ‘Christ-mass.’ Thus it is of Romish origin, brought over from Paganism. But, says someone, Christmas is the time when we commemorate the Saviour's birth. It is? And who authorized such commemoration? Certainly God did not. The Redeemer bade His disciples "remember" Him in His death, but there is not a word in Scripture, from Genesis to Revelation, which tells us to celebrate His birth. Moreover, who knows when, in what month, He was born? The Bible is silent thereon. Is it without reason that the only "birthday" commemorations mentioned in God's Word are Pharaoh's (Gen. 40:20) and Herod's (Matt. 14:6)? Is this recorded "for our learning?" If so, have we prayerfully taken it to heart? And who is it that celebrates "Christmas?" The whole "civilized world." Millions who make no profession of faith in the blood of the Lamb, who "despise and reject Him," and millions more who while claiming to be His followers yet in works deny Him, join in merrymaking under the pretence of honouring the birth of the Lord Jesus. Putting it on its lowest ground, we would ask, Is it fitting that His friends should unite with His enemies in a worldly round of fleshly gratification? Does any truly born-again soul really think that He whom the world cast out is either pleased or glorified by such participation in the world's joys? Verily, the customs of the people are vain; and it is written, "Thou shalt not follow a multitude to do evil" (Ex. 23:2). Charles Spurgeon once said: "We have no superstitious regard for times and seasons. Certainly, we do not believe in the present ecclesiastical arrangement called Christmas: first, because we do not believe in the mass at all, but abhor it, whether it be said or sung in Latin or in English; and, secondly, because we find no Scriptural warrant whatever for observing any day as the birthday of the Saviour; and, consequently, its observance is a superstition, because not of divine authority. Superstition has fixed most positively the day of our Saviour's birth, although there is no possibility of discovering when it occured. Fabricius gives a catalogue of 136 different learned opinions upon the matter; and various divines invent weighty arguments for advocating a date in every month of the year. It was not till the middle of the third century that any part of the church celebrated the nativity of our Lord, and it was not till very long after the Western church had set the example that the Eastern adopted it. Because the day is not known, therefore superstition has fixed it; while, since the death of our Saviour might be determined with much certainty, therefore superstition shifts the date of its observance every year. Where is the method in the madness of the superstitious? Probably the fact is that the holy days were arranged to fit in with the heathen festivals. We venture to assert, that if there be any day in the year, of which we may be pretty sure that it was not the day on which the Saviour was born, it is the twenty-fifth of December. ... regarding not the day, let us, nevertheless, give God thanks for the gift of His dear Son." -- Charles Spurgeon, from a sermon delivered on 24th December, 1871. Not once does scripture teach believers to celebrate his birthday (which those who rightly divide the word agree never happened in December). What is found in scripture is reference to the pagan practice of what today is, a whitewashed disguise "christmas". "<="" color="#008000" FONT="" size="5">Learn not the way of the heathen, ... for the customs of the people are vain: for one cutteth a tree out of the forest, the work of the hands of the workman with the axe. They deck it with silver <="" color="#008000" FONT="" size="5"> and with gold <="" color="#008000" FONT="" size="4">; they fasten it with nails and with hammers, that it move not." The Creator wasn’t pleased with the practice then. Why would He be now? <="" color="#008000" FONT=""> Yet people use the same old reasoning. All throughout scripture Elohim warns his people and chastises them over and over for justifying and following pagan customs. Today these same practices that were heathen then, and rationalised as acceptable at that time, are condoned by "the church" as "Christian" today! How can people make something right when God says it is heathen? celebrated the re-birth of the sun god, by taking over and desecrating the Jerusalem Temple Mount, erecting a statue of Zeus, and offering a sacrifice of a pig on the altar of the temple, on the "birthday" of Zeus; December 25th. The Jews underwent severe persecution by this ruler. Three years later on Kislev 25, a group of Jews broke down the statue of Zeus, cleansed the Temple and held a ceremony of rededication, which was the beginning of an eight day celebration of the Feast of DEDICATION, HANUKKAH. The oil lamps were lit; having only one days supply of oil; yet miraculously they burned for eight days. Since then this Feast of Dedication has been marked with the lighting of the Menorah and the rehearsing of the Hallel (Psalm 113-118). This is a Feast in which all believers; those of the “general assembly and congregation of the first born”; can personally celebrate deliverance from pagan worship ( even of the sun god) and the re-dedication of our lives to serve the true and living Elohim. A time of great rejoicing; with no fasting or public mourning. Why not observe for the right reasons; on the right days, the FEASTS on Elohim’s calendar, (the Creator does have His calendar) instead of pagan "Christmas", on man’s Gregorian calendar December 25? "Christmas – it was according to many authorities NOT celebrated in the first centuries of the Christian churches as the Christian usage in general was to celebrate the death of remarkable persons rather than their birth. A feast was established in memory of the birth of the Saviour in the FOURTH CENTURY. In the Fifth Century the Western Church (Roman Catholic) ordered it to be celebrated forever on the day of the old Roman feast of the birth of Sol. The holly, mistletoe, the yule log and the wassail bowl are of pre-Christian times. The Christmas tree has been traced back to the Romans. It went from Germany to Great Britain." "Christmas (i.e., the Mass of Christ) was not among the earliest festivals of the church." 1 And it came to pass in those days, that there went out a decree from Caesar Augustus<="" color="#008000" font="">,<="" color="#008000" font="" size="5"> that all the world should be taxed. _Israel is located, between 29°-33° north of the equator. _The rainy season extends from October to early May, and rainfall peaks in December through February. Humidity is usually in the 90% range all the time. See "Song of Solomon" (Song of Songs) 2:11. 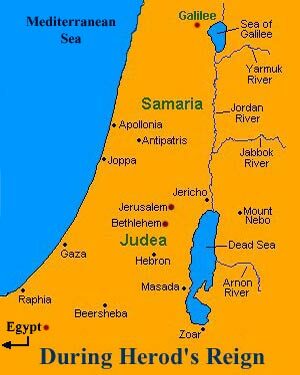 _The average low temperature for the month of December in Bethlehem is 42°F at night, and 39°F for Nazareth at night. _Shepherds do not watch or expose their flocks or themselves to these conditions. <="" FONT="" size="4">If Yahshua Messiah had been born on December 25th. Joseph would not have departed for Egypt until after February 4th, forty plus days later, after Mary's (Miriam's) purification, and their sin and burnt offerings. The average night time low at this time in Bethlehem would be a cold and wet 39°F with a much lower windchill factor; Nazareth would be even colder. These are poor travelling conditions for anyone on foot or donkey, much less for or with a newborn baby. 2<="" color="#008000" font="" size="4">1 And when eight days were accomplished for the circumcising of the child, his name was called YEHOSHUA, which was so named of the angel before he was conceived in the womb. 24 And to offer a sacrifice according to that which is said in the Torah of יהוה<="" color="#008000" FONT="">, A pair of turtledoves, or two young pigeons. 2 Speak unto the children of Israel, saying, If a woman have conceived seed, and born a man child: then she shall be unclean seven days; according to the days of the separation for her infirmity shall she be unclean (not pure). 4 And she shall then continue in the blood of her purifying three and thirty days (40 days total); she shall touch no hallowed thing, nor come into the sanctuary, until the days of her purifying be fulfilled. 5 But if she bear a maid child, then she shall be unclean two weeks, as in her separation: and she shall continue in the blood of her purifying threescore and six days (80 days total is twice that of a male). 7 Who shall offer it before יהוה, and make an atonement for her; and she shall be cleansed from the issue of her blood. This is the law for her that hath born a male or a female. 8 And if she be not able to bring a lamb, then she shall bring two turtledoves, or two young pigeons; the one for the burnt offering, and the other for a sin offering: and the priest shall make an atonement for her, and she shall be clean. Because this was a Roman TAXATION (Enrollment/Assessment) that was proclaimed prior to the assessment period, ALL Jews would have already returned to their TRIBAL city (Joshua Chapter15) in time for the TAXATION (Assessment). Therefore, Mary (Miriam), Joseph, and child would not have stayed in Bethlehem any more than 40 days after the birth of Yehoshua. That would be seven days for her issue of blood, the eighth day for Yehoshua's circumcision, and the eight day was, also, the first day of her final thirty-three days of purification. Thus the day after forty days from the Messiah's birth they (now considered "Clean") departed north from Bethlehem to Jerusalem (for sin & burnt offerings), and then escaped to Egypt (where they remained for more than two years). <="" color="#008000" font="" size="4">It wasn't <="" color="#008000" FONT="">winter, even after more than forty days in Bethlehem and their short trip to Jerusalem. Travelling by night in the winter would have been a horrible experience for anyone on foot or donkey, especially with a baby. Additionally, ALL assessments, whether grain, fruit, sheep or other form of property assessment (except money) would out of necessity need to be transferred and placed into storage areas prior to the settling in of winter, which is when they would be needed. 12 And being warned by Elohim in a dream that they (the Wise men) should not return to Herod, they departed into their own country another way. 13 And when they (the Wise men) were departed, behold, the angel of יהוה appeareth to Joseph in a dream, saying, Arise, and take the young child and his mother, and flee into Egypt (from Judea /Jerusalem / Bethlehem), and be thou there until I bring thee word: for Herod will seek the young child to destroy him. 15 And was there (Egypt) until the death of Herod: that it might be fulfilled which was spoken of יהוה by the prophet, saying, Out of Egypt have I called my son. 16 Then Herod, when he saw that he was mocked of the wise men, was exceeding wroth, and sent forth, and slew all the children that were in Bethlehem, and in all the coasts thereof, from two years old and under, according to the time which he had diligently enquired of the wise men (a period of two years). When Rome conquered Jerusalem, the Jewish people were required to pay taxes to and/or work for their conquerors. These tax assessments took place at least twice during the thirty-seven year period in question on the anniversary of the Battle of Actium; which took place ON September 2nd. 31 BC. 1. Now "CYRENIUS" (Quirinius), a Roman senator, and one who had gone through other magistracies, and had passed through them till he had been consul, and one who, on other accounts, was of great dignity, came at this time into SYRIA, with a few others, being sent by Caesar to be a judge of that nation, and to take an account of their substance. Coponius also, a man of the equestrian order, was sent together with him, to have the supreme power over the Jews. Moreover, "CYRENIUS" came himself into JUDEA, which was now added to the province of SYRIA, to take an account of their (JEWS) substance, and to dispose of (Herod's son) Archelaus's Money; (after Herod's death and Archelaus's removal) but the Jews, although at the beginning they took the report of a(nother) TAXATION (Enrollment/Assessment) heinously, yet did they leave off any further opposition to it, by the persuasion of Joazar, who was the son of Beethus, and high priest; so they, being over-persuaded by Joazar's words, gave an account of their estates (tribal property inheritances), without any dispute about it. 1. <="" color="#008000" font="" size="4">When "CYRENIUS" had now disposed of Archelaus's Money, and when the TAXINGS (Enrollments/Assessments) were come to a CONCLUSION, which were made in the thirty-seventh year (on the Anniversary) of CAESAR'S VICTORY over MARK ANTHONY at ACTIUM, <="" color="#008000" FONT="">. . .
* Luke's TAXATION was then an event that took place during a year on the Anniversary of the historic "Battle of Actium", which took place on September 2, 31 B.C. ;This completely rules out the month of December in any year on any calendar (Julian, Gregorian or Hebrew). This is much more probable than a cold wet rainy December; no shepherds would be out all night with their flocks (lambs born in the spring) under those conditions. Additionally, hundreds of thousands of Jews (or more) would have been required to travel back to their city of birth under cold and rainy weather conditions in order to pay their taxes (be assessed/enrolled). This would, also, be a great inconvenience for the Romans too! Note: In 46 BC, when the Roman "Julian Calendar" was adopted, as stated earlier December 24th was the shortest day of the year; December 25th was the first annual day that daylight began to increase. Thus, the origin of the REBIRTH or Annual Birthday of the Invincible SUN. In accordance with the Roman "Julian calendar," the "Saturnalia" festival appears to have taken place on December 17th; it was preceded by the "Consualia" near December 15th, and followed by the "Opalia" on December 19th. These pagan celebrations typically lasted for a week, ending just before the late Roman Imperial Festival for "Sol Invictus" (Invincible Sun) on December 25th. In 1582 AD. Roman Catholic Pope Gregory the XIII caused the current "Gregorian Calendar" to be adopted, in order to eliminate the solar time shift error that was introduced over the time period of 1,629 years by the inaccurate "Julian Calendar." By December 1582 AD the shortest day of the year on the Roman "Julian Calendar" had shifted 12 days from Dec. 24, 46 BC. to Wednesday, Dec. 12, 1582 AD. On the new Roman Catholic Gregorian calendar the shortest annual day was numerically shifted back 10 days to the 22nd of December, where it remains to this day. Therefore, Wednesday, December 12th, 1582 AD, became Wednesday, December 22nd, 1582 AD. CHECK IT OUT - IT'S THE TRUTH !